// The plan: Attach an interrupt to an IOPIN that is driven by the timer. Using timer interrupts with the Energia/MSP430 IDE. I was curious whether you could run interrupts within Energia code on the TIMSP430 – guess what? You can. Here’s some code that toggles the Green LED during an interrupt service routine. The RED LED is toggled in the main program loop. 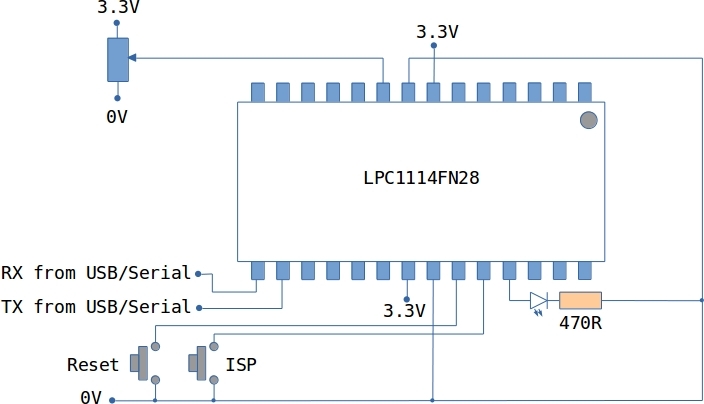 The code runs on the MSP430 Launchpad with the MSP430G2553 microcontroller. This is a simple game for the LPC1114FN28 (DIP version). The user controls the location of an @ symbol on the display, trying to steer it away from the edges of the ‘tunnel’. The user starts with 16 ‘lives’ and the game ends when the user runs out of lives. The wiring diagram is as shown below. The two buttons are used to reset and enter ISP mode. The potentiometer is used to control the @ symbol. The “busy” flag is used in the prbs function in case the routine is called from with an interrupt service routine leading to a danger of re-entrancy.